Yes – another recipe using pumpkin. Well, it is that time of year and now that fresh cranberries are available, I’ll be making this regularly until supplies run out. You can also use frozen cranberries so you may want to stock up and freeze some for those months when they’re out of season. Likewise, stock up on canned pumpkin which has disappeared from supermarket shelves here by January. This recipe is dairy-free and can also be wheat free if you switch the all-purpose (plain white) flour for spelt flour. I don’t know why it’s called ‘bread’ because it’s really a cake and is lovely with an afternoon cup of tea. 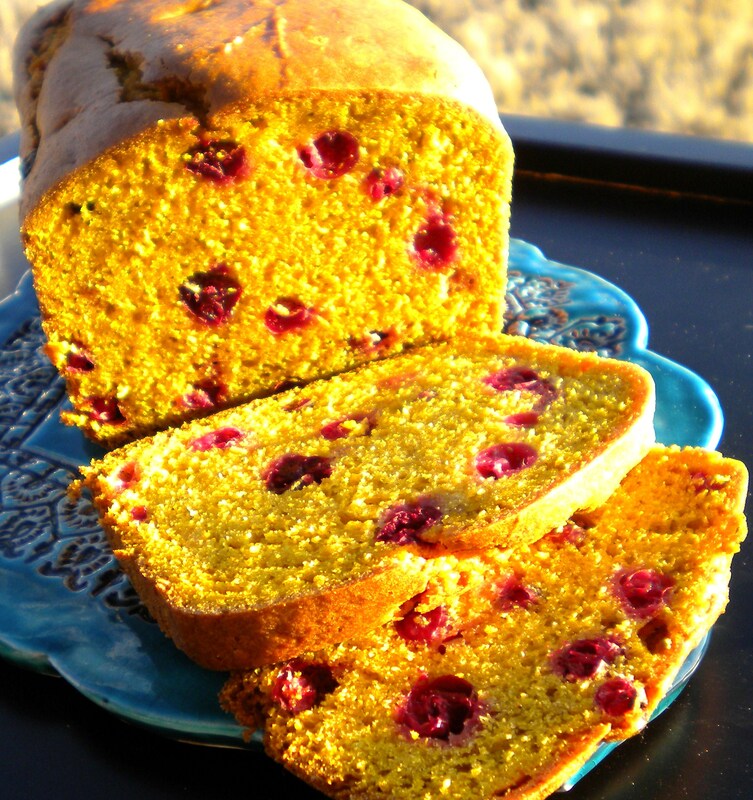 The end result is wonderfully moist and the whole cranberries pop in your mouth with a tangy burst. If you’re an adventurous cook, it makes a fabulous base for a bread pudding; cut into 1 inch chunks and add a little fresh ginger to your custard sauce but strain it out before baking and serve with some cranberry caramel syrup (see previous recipe for Pumpkin Grand Marnier Cheesecake). It makes a wonderful festive holiday gift and can be made up to 4 days ahead; keep it well wrapped in the fridge – it also freezes well, wrapped in a double layer of heavy duty foil. Finally, you won’t get such a pretty result if you use brown sugar and whole wheat flour so stick to the recipe here. In a large bowl using an electric whisk/mixer, beat together the pumpkin, sugar, water, oil and eggs. Into this, sift the flour, baking powder, bicarb of soda, salt and spices and stir just until you have a smooth batter. Fold in the cranberries and spoon into the loaf pan, spreading evenly. Bake in the middle of the oven for 1hr 15 minutes or until a toothpick inserted into the center comes out clean. Cool on a rack in the pan for 10 minutes then turn it out onto the rack to cool completely before wrapping and chilling. Did you know if you ask your store manager to order something special they often will order it for you? My local City Market ordered me dilled green beans (canned) that I use in my three bean salad and a special sausage that I like. I tried that and was told ‘no, sorry’….. I will be making this with the children this week at school. Do you want any pics of them while they are creating your recipe? My son and I are going to make this too! He is home from college and helps me cook bakery goods! Sue Ellen? Miss Ellie? Where is this, Dallas? This bread is really yummy. It would make a great hostess or teacher gift during the holidays.